Over 700 athletes raced the third edition of the TriStar Worms-Germany in the heart of Central Europe in one of the favourite TriStar events. With best weather conditions, both Germans Fabian Conrad and Nina Kuhn took the victory today at the TriStar111 race (1km swimming, 100km cycling and 10km running). Conrad got the triumph after an impressive cycling segment, where he kept the first position after emerging from the water as the first athlete. Fabian Conrad (3h23:54) was leading the race from the word ‘go’ till the finish line. German Christian Brader was second and worked hard on the run to catch the leader, but Conrad today never looked back and pulled away from the rest of the PRO field since the start. Till Schramm, official TriStar Ambassador, after a good performance in the bike leg, overtaking some athletes, finished third in Worms. This year it was the first time with the new bike-track, wich lead the athletes through Worms twice as well as through the surrounding wineyards thus more interaction with the spectators was given. “After the first round I was actually already done, but all the viewers pushed me”, mentioned Christian Brader. This applies to Fabian Conrad as well, who was able defending his lead in the following 10 km run through Worms. “Running was quite hard, since during bike session I had to match against strong competitors. Winning the todays race was not planned. I’m looking forward to the brief regeneration based on the TriStar distances”, he said. In the female category German Nina Kuhn won the TriStar111 Worms-Germany. She took the lead right at the beginning of the race and kept it till the Finish Line at all times, crossing it in 3h49:21. The local hero Anna Kusch was second almost 11 minutes back (4h00:35), while Nicole Best (also from Germany) was third. Both winners of the TriStar33.3 Worms-Germany (300m swimming, 30km cycling and 3km running) were Germans: Marc Rink won the male competition in 1h17:30 and Carina Brechters the female category in 1h25:27. 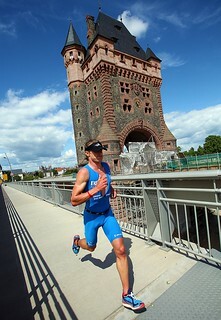 Further information on www.tristar111germany.de and Live Rankings, full results, Leaderboards, Updates and images on www.tristarlive.com during race day. Mehr als 700 Athleten starteten bei besten Wetterbedingungen zur 3. Auflage des TriStar Worms-Germany im Herzen von Mitteleuropa bei einem der beliebten TriStar Events. 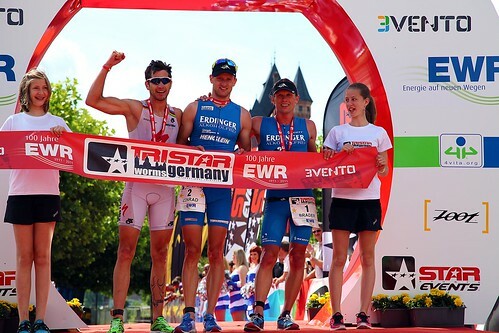 Die Deutschen Fabian Conrad and Nina Kuhn errangen den Sieg beim TriStar111 Rennen (1km Schwimmen, 100km Radfahren und 10km Laufen). Conrad, der für den TSG 08 Roth startet, begann seinen Triumphzug nach einem eindrucksvollen Radsplit, auf der er als erster Athlet, der aus dem Wasser kam, die Führung übernahm. Er dominierte das Rennen vom Start an und behielt die Führung bis zum Zieleinlauf. Der Deutsche Christian Brader wurde Zweiter. Er arbeitete hart daran, den Führenden noch einzuholen. Conrad jedoch, der sich nicht ein einziges Mal umdrehte, setzte sich vom Start an vom Feld der weiteren Profi-Athleten ab. Till Schramm, offizieller TriStar Repräsentant, zeigte eine sehr gute Leistung auf der Radstrecke und kam als Dritter nach Worms ins Ziel. Ihre Premiere erlebte hierbei die neue Radstrecke, die die Athleten zwei Mal durch Worms und die umliegenden Weinberge führte und somit noch mehr Interaktion mit den Zuschauern bot. „Nach der ersten Runde war ich eigentlich schon platt, aber die vielen Zuschauer haben mir noch mal einen Schub gegeben“, sagte Christian Brader. Dies galt auch für Fabian Conrad, der seinen Vorsprung im abschließenden Lauf über 10km durch Worms verteidigen konnte „Das Laufen war hart, da ich beim Rad gegen starke Konkurrenz anzutreten hatte. Der Sieg heute war so nicht geplant. Jetzt freue ich mich auf die kurze Regeneration, den die Distanzen der TriStar-Serie bieten“. In der Damenwertung gewann Nina Kuhn den TriStar111 Worms-Germany. Als dritte Frau aus dem Wasser, übernahm sie im Rad-Split die Führung und konnte diese Position bis zum Ziel halten. Sie siegte mit einer Zeit von 03:49:21 Stunden. Die Lokalmatadorin Anna Kusch wurde Zweite mit einer Zeit von 04:00:35 Stunden. Den dritten Platz belegte Nicole Best in 4:01.02 Stunden. Die Siegerin Nina Kuhn zeigte eine beeindruckende Stärke während des ganzen Rennens. Über die kurze Distanz des TriStar33.3 (300m Schwimmen, 30km Radfahren, 3km Laufen) konnten die beiden Deutschen Marc Rink (01:17:30 Stunden) und Carina Brechters (01:25:26 Stunden) das Rennen für sich entscheiden. Dem TriStar Team gelang es neue Distanzen im Triathlon-Sport zu etablieren, hierzu zählen die 111km- und 222km-Distanzen. Beide Distanzen wurden von der ITU, dem Internationalen Triathlon Verband, anerkannt. Gleiches gilt auch für das brandneue Team Racing Konzept T5.
. Weitere Informationen unter www.tristar111germany.de und Live Einstiege, Ranglinsten, Infos zu den Führenden, Updates und Fotos unter www.TristarLive.com während dem Rennen. Fabian Conrad ist the winner of TriStar Worms-Germany 2012! More and more agegroupers are on the RUN split now, so here's an overview about the course. ★ 11 ★ Nina KUHN is the leading the race in the Woman category at T2. Fabian Conrad is still leading the race after the bike course. Christian Braader and Till Schramm with 5minutes following 5minutes behind. Jürgen Stilgenbauer is on position 6. The course takes the athletes into the beautiful whineyards around Worms. The TriStar111 athletes will have to finish two big rounds whereas the TriStar33.3 athletes will only have to ride one short round on the bike course. TriStar Worms-Germany started at 8am with perfect weather conditions. 15 degrees celsius, blue sky and a calm wind. First pro out of the water was Fabian Conrad, race number ★ 2 ★, in 01:12:15. Followed by Denis Biro ★ 451 ★ (01:12:21) and Wade Weightlman ★ 208 ★ (01:12:51). With over 700 Athletes lined up with the professional’s up at the front of the harbour, the third TriStar111 Worms-Germany event took a leaping start into the water as the race began just half an hour ago. Most participants are now out of the water and well on their way out on the Bike Course. TriStar Worms-Germany 2012, 3rd edition, just started with 20 pro athletes and 700 agegroupers. Right after all the TriStar111 athletes are in the water, the athletes of the TriStar33.3 will start their race from the second starting point in the harbour of Worms. Just 30 min to go! Looks like a sunny day ahead! Good Morning. Today is race day. Everything is rolling here in the Worms Media Center and we’ll be bringing you your live coverage from the race over the next exciting hours. The actual and official measured average water temperature in the harbour of worms is 20,1 degree Celcius. Here we go! In this direction! Race director Lothar Leder shows us the Bike Course Sign. The third edition of the TriStar111 Germany brings even more fun to Worms this Sunday! TriStar is back in Germany for the third year with the very special TriStar Worms-Germany, to be hosted in the heart of Central Europe in one of the cities with the longest Triathlon background in Europe: Worms. The most important race of the weekend will be the TriStar111 Worms-Germany on Sunday June 10th (8h00), but there will be also a TriStar33.3, a Relay Challenge (over the TriStar111 distance) and a brand new StarKids Run powered by Volksbank Worms-Wonnegau eG on Saturday. More than 700 athletes will enjoy the fun and easy-recovery format of the Triathlon, in a family focused event the next days. TriStar111 Worms-Germany, a triathlon race covering a total distance of 111 km, with 1k swimming, 100k cycling and 10k running, will have a strong PRO field with many German and international professional athletes. German PRO athletes such as Christian Brader, Fabian Conrad, Juergen Stilgenbauer, Tobias Zingel, Till Schramm, Nicole Best and Nina Kuhn as well as International athletes such as British Martyn Edwards, Danish Carsten Nørregaard or New Zelander Paul Westwood will fight for the victory. Some of the novelties for this edition are the free StarKids Run powered by Volksbank Worms-Wonnegau eG race on Saturday and a new bike course which leads the TriStar111 on a 2 x 50km circuit through the picturesque vineyards around Worms. Back in 1983 Worms hosted one of the first triathlon races in Germany, in this special spot for the triathlon scene in Central Europe. Due to its central location within Germany and the beautiful region it provides excellent conditions to the athletes. The 1k swim split in the calm waters of the raft harbour of Worms is followed by 2 laps of 50km bike ride through the beautiful Rheinhessen wine country. A 10k run integrates the 2 millennia of history of Worms. Out of the transition zone crossing the newly built bridge across the Rhine back into the historic old town completes this extraordinary race day. Coming up: TriStar Worms-Germany Live Coverage this weekend! Welcome to the third edition of the TriStar Worms-Germany 2012! The next live Event covered on TriStarLive.com will be TriStar Worms-Germany this weekend! The origins of the Worms’ cathedral can be traced back to the late Roman era. Under Bishop Burchard (1000 – 1025AD), the most important bishop of Worms, a new early-Romanesque cathedral was built. It had today’s measurements and some of the original parts still remain. Originally a Carolingian one-roomed church in the 8th/9th Century. The former parish church near Andreasstift became the starting point of the evangelical movement in Worms in 1521 and counts as one of the oldest evangelical churches in south west Germany. Chapter church of the Martinsstift whose buildings have almost completely disappeared. It is a buttress basilica with architectural forms from the 12th Century. Up until the 15th Century, it was a burial place for the Kämmerer family whose courts lay nearby in the Kämmererstrasse. The Liebfrauenkirche stands in the middle of the original Liebfrauenmilch vineyards. It is an important late Gothic building which was finished in 1465. The original Liebfrauenmilch is still cultivated around the Liebfrauenkirche. The first documented synagogue in Worms was built in the year 1034. For centuries the synagogue represented the center of jewish life in Worms. In the pogrom night of 1938, the synagogue was burnt down. Due to the historical religious importance of the Worms’ synagogue it was rebuilt in 1961. The Rashi-House was built in 1982 and stands on historical ground: the building, which lies behind the synagogue is assumed to be the site of the medieval Talmud school. Since late medieval times it has been used as a dance and wedding house and then as a hospital. The cemetery originated as the first synagogue was built in 1034. This means that Worms’ Jewish cemetery is the oldest still excisting Jewish cemetery in Europe. A number of renowned Jewish scholars are buried here. A single naved Baroque hall church was built as a Lutheran town church from 1709-25 in place of the magnificent old town hall “Münze”. Following the destruction of 1945, the interior was rebuilt differently according to plans from Prof. Otto Bartning. St. Paul’s was built on the remains of a Salian castle. The Dominican order also lost its monastery (built 1226) as a result of secularisation. In 1929 the Dominican monastery was officially reopened. During bomb attacks in 1945 large parts were destroyed but rebuilt by 1947. In 1868 the largest Reformation monument in the world was unveiled. Here, the history of the Reformation is presented from its very beginning into the pre-Reformation era and on to the 19th Century. Martin Luther is placed in the centre with the pre-Reformers sitting at his feet. Heylshof with the largest private art collection of the late 19th Century is one of the leading art museums in Rhineland-Palatinate. It has been preserved in its original condition at the original location. A plaque on the ground in the Heylshof garden marks the spot where Martin Luther refused to recant his teachings in front if the Imperial Diet in 1521. In those days the bishop’s palace extended as far as this garden – the palace was destroyed in 1689. Visit the Nibelungen Museum on a dreamlike journey through time and space. The Nibelungenlied – one of the most famous stories in world literature – is performed using modern multimedia technology. The Romanesque basilica was the chapter church of the Andreasstift (today’s town museum). The church architecture shows forms of the early 13th Century. Gothic changes can be seen in both the church and the adjoining cloister. This bronze figure on the bank of the Rhine erected in 1905 recalls the sinking of the Nibelungen treasure into the waters of the Rhine. Worms is the starting point of the Nibelungen route which leads past the Lorsch monastery in the direction of Hungary.